Since then, the clear waters have been tainted by fuel oil leaking from the ship, known as the Solomon Trader. CNN affiliate Radio NZ reported this week about 100 metric tons of fuel have spilled so far. But the worst could be to come. Australian officials said there is a “high risk” the remaining heavy fuel oil on the ship — about 600 metric tons — could contaminate the area even further. The Solomon Trader ran aground in Kangava Bay at Rennell Island, the DFAT said, the southern third of which has been a designated UNESCO World Heritage Site since 1998. The site is the largest raised coral atoll in the world, according to UNESCO, which said in a statement this week the leak is taking place “just outside” the World Heritage site. However, “there is concern for a possible impact on the World Heritage site and the livelihoods of the local communities,” UNESCO said. The oil had spread about 5 to 6 kilometers and has begun to wash up onshore, the DFAT said. And the environmental impacts of the leak have already begun, according to Radio NZ. Loti Yates, the director of the Solomon Islands Disaster Management Office, told the outlet that dead fish have been washing up on beaches. Australian officials are supporting the Solomon Islands in efforts to mitigate ecological damage. The DFAT said the Australian government has deployed special equipment and an eight-person response crew from the Australian Maritime Safety Authority. 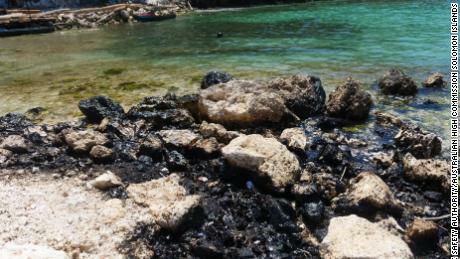 “Efforts will focus on targeted oil spill mitigation and remediation activities offshore in Kangava Bay,” the DFAT said. The government of the Solomon Islands says the “responsibility to salvage the vessel and mitigate the environmental impact of this incident rests with the commercial entities involved,” including the ship’s owner, King Trader Ltd., and its insurer, Korea Protection and Indemnity Club. The ship had been chartered by a bauxite mining company, the statement said, when it was grounded last month. Since then, a number of factors have delayed the salvage response, the statement added, including the vessel losing power and inclement weather. The companies are now working on transferring the remaining 600 metric tons of fuel oil on the ship to different tanks, they said, which will be pumped onto a separate barge that is en route. Correction: The headline of this story has been updated to more accurately describe the type of coral atoll affected by the oil spill. CNN’s Sarah Faidell, Jonny Hallam and Eric Cheung contributed to this report.